It's time for another Beach Hut Deli Player Signing Announcement! 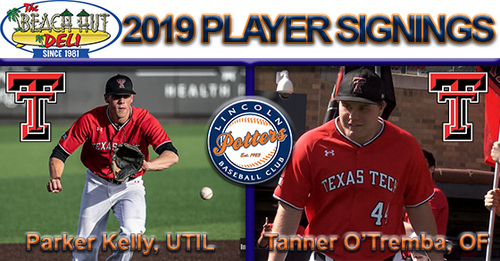 We are EXCITED to welcome two players from Texas Tech University, utility player Parker Kelly and outfielder Tanner O'Tremba to the Potters family! Kelly is currently a sophomore at Texas Tech. The Wichita Falls, TX native played in eight games a freshman for the Red Raiders and making one start. During his sophomore campaign he is hitting .300 with five doubles and RBI. O'Tremba is currently a freshman at Texas Tech. In 70 at-bats this season he is hitting .257 with two home runs, five doubles, and 16 RBI. Welcome to the squad boys and make sure to stop by Beach Hut Deli here in Lincoln to "Potter Up at the Hut"!